When a restaurant doesn’t take reservations, you learn to arrive early to avoid the wait. Visiting Bar Buca earlier has its perks: from 4pm to 7pm diners who order a drink receive an aperitivo platter to munch on. 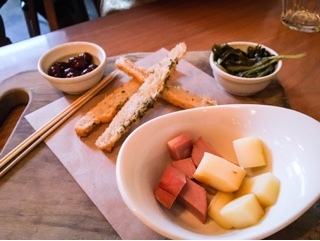 During our visit, it consisted of cubes of mortadella & fontina, small soft olives, focaccia toasts and deliciously tart pickled dandelion leaves. 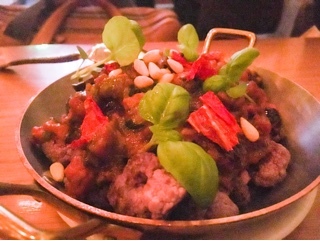 The original “tapas” bar of the neighbourhood, aperitivo is the practice of having drinks and nibbles before dinner. The fact that you can continue dinner in the same establishment? That’s the ideal Canadian way. Their Winterlicious menu sounded delicious and thankfully included their regular offerings. Although the sardella looks simple - like some sort of spread on toast - the vivid flavours are a far cry from simple. 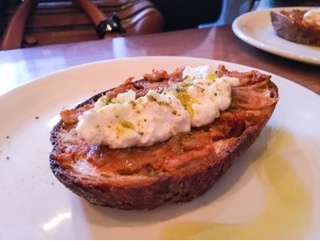 The fermented smelts paste on the bottom has a wonderful brininess, while the hits of chili is slightly calmed by the creamy burrata on top. Bar Buca’s crudo uses thick slices of Guelph arctic char topped with a liberal sprinkling of squid ink salt and fennel fronds. 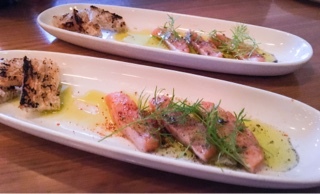 The Chef suggests eating the fish first and reserving the crostini to sop up the remaining smoked olive oil. We happily obliged, who am I to question someone that can make such a tasty dish? The barbabietole should have been served first, as after two stronger dishes the salt baked beets topped with pistachio seemed plain and non-memorable. 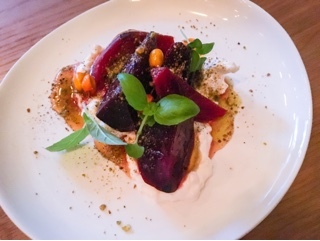 Nevertheless, it’s a pretty dish and if you enjoy beets they were prepared nicely. 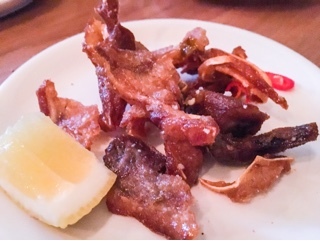 Crisp bits of pig ear, cheek and other facial features followed, lightly dusted with salt and chili slices should you want the heat. All the greasy crunchiness would have gone wonderfully with beer… not horrible with wine either. 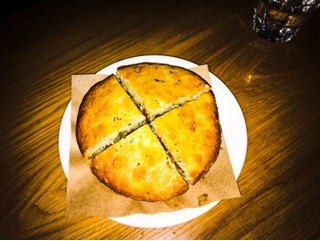 What will have me returning to Bar Buca are their schiacciata, fragrant oily Tuscan flatbread with the richness of focaccia but slightly denser. Cut into quarters, it’s great for sharing and given their heaviness, you’ll likely want to split with a friend. The porchetta contained plenty of pieces of plump roasted pork drizzled with an herby aioli. I would have liked the apple mostarda to be cut into smaller pieces as the large chunks of sweet fruit was too much for me. Meanwhile, the salsicce version made with slices of grilled pork and fennel sausage was better balanced. Along with the lean sausage there was roasted bell peppers, sweet cipollini onions, arugula that helped cut through the greasiness and a thin layer of soft scamorz cheese. 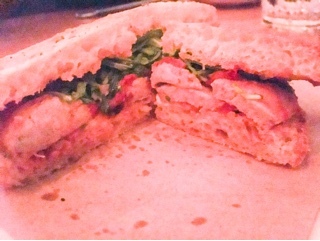 The sandwich was molto delizioso! After so many indulgent dishes, the caponata di romanesco, a roasted cauliflower and eggplant mixture in a vinegary tomato sauce, should have been a great ending. But, something about the spices (could have been nutmeg or anise) gave the vegetables a Middle Eastern taste that didn’t go with the meal. 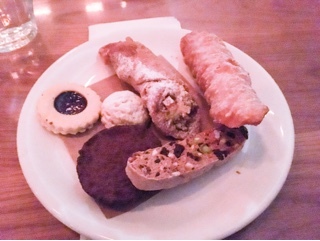 To end, we shared a plate of pastries. The cannoli was tasty with plenty of ricotta cream studded with chocolate chips. I also enjoyed the chewy amaretti cookie dusted with powdered sugar. The torta cioccolatino is extremely chocolaty (imagine a flourless chocolate cake with extra unsweetened cocoa powder) and should be shared. While the jam filled shortbread should not as it turns to dust if you attempt to cut through it. 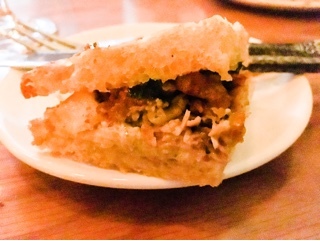 I rather enjoyed Bar Buca’s small plates experience. In an era when menus in restaurants are swinging towards the tapas route, I find some dishes are really not most conducive for sharing (is a hunk of short rib really the best thing)? But all the items work at Bar Buca. Add some wine and special friends, then you’re in for a wonderful evening.